Hi Jennifer! 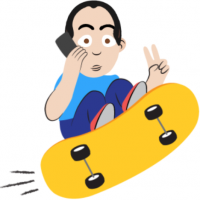 Let's dissect how bad your customer service is! And after all that, I still need help. My name is Toja. 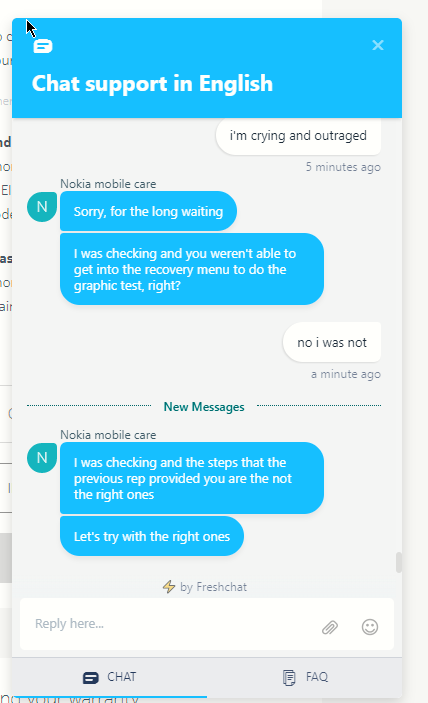 I am the not-so-proud owner of a Nokia 6.1. 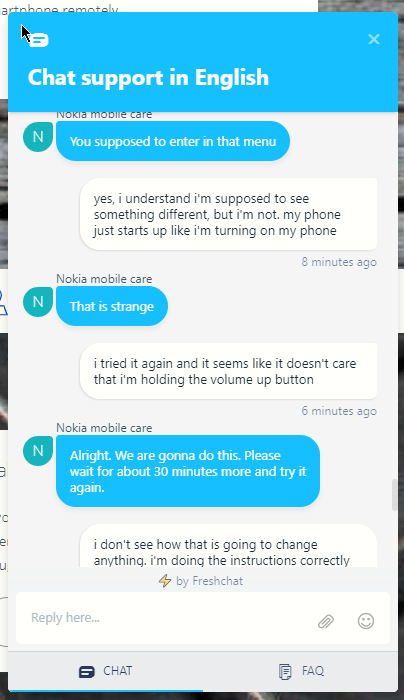 My Nokia 6.1 has an issue with call volume using headphones. I did what any other slightly informed customer would do. 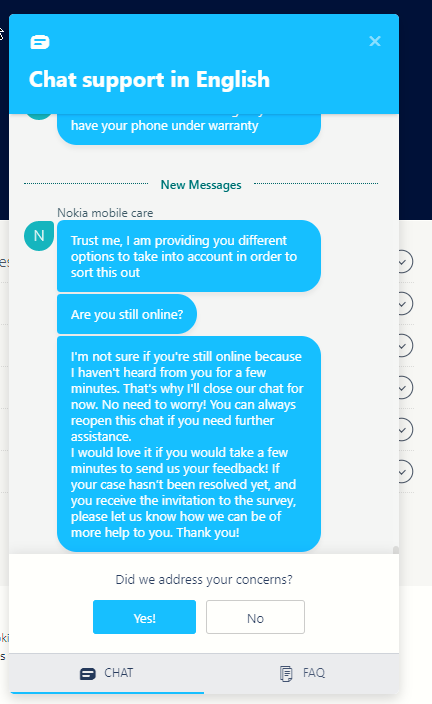 I went online to start a session with Nokia support via chat. I laid out my issue, and a rep gave me a few steps to try. Courteous and helpful as they guided me through uninstalling Google app updates and deleting cache. Afterwards I did not have anyone to call so I parted ways with the rep and let them know I'll test later. An hour goes by and I've tested with a handful of calls. Call volume is still much too low. I've tried different apps, I've tried different headphones, I've restarted my phone so many times the Nokia tone plays in my head even when the room is silent. I reach out again through chat. I explain to Jennifer my situation and hope that she can gather all the clues she needs to get caught up from my last chat. She (supposedly) understands the situation and gives me a simple step to try. She explains to me the steps to boot into my phone's recovery mode. Having owned more than a few mobile devices in my lifetime I had a very clear idea that I was going to boot into a screen I seldom have to see. 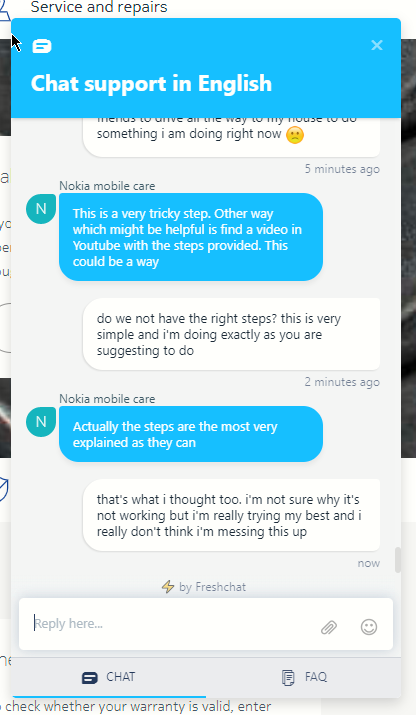 I try the steps and they do not work. Jennifer is obviously also very confused with my results. We're scratching our heads, but Jennifer has a better idea. 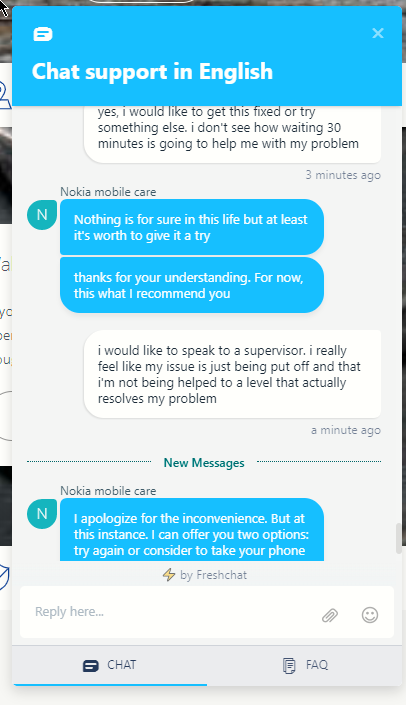 She decides to make my issue someone else's problem and asks me to wait 30 minutes and try again. I try so hard to wrap my head around the logic but I can't. If my TV won't turn on I'm not going to magically expect it to turn on in 30 minutes. I'd rather hit the TV with all I've got in my arsenal to get somewhere. Jennifer is determine to brush me off. Spewing some strange, unasked for wisdom, she urges me to just sit idly instead of coming to my rescue. Jennifer refuses to acknowledge that there is a person on the other side of the screen. My phone is my most useful tool, my "Break Glass in Case of Emergency", my link to people I love. At this point I'm mildly frustrated and surprised at Jennifer's gall. She's giving the customer an ultimatum of treading water or walking away. Jennifer has done the customer service equivalent of blankly staring at me and letting me know "I have zero time for your problem. Go AWAY"
Her offer to take my phone in for repair falls short on me. 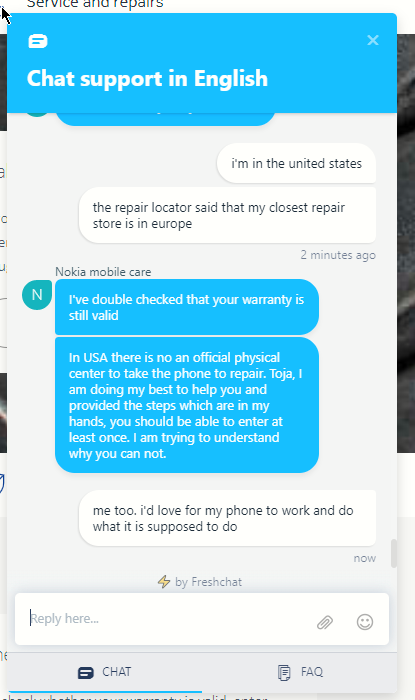 I am in the United States and the closest official repair shop is in Europe. I explain. My frustration is peaking. I'm running around in circles for no reason. Jennifer's apathy to my problem is striking my nerves right out of the park. Jennifer disregards, of course, and asks if I can be assisted by someone. I look around my almost empty house. The only other inhabitant, my dog, is laying next to me chewing his favorite toy. Am I required to have someone around me at all times? I'm done with games. My entire reason for wasting so much time with Jennifer is flung into the forefront of my mind. The night before I was trying to communicate with my significant other. Thousands of miles away, I try so hard to hear him through my headphones. His voice is the only thing that connects us for now and my phone's inability to accomplish such a simple task is throwing kerosene on my frustration. Jennifer cares not. She's more than ready to fling canned responses at me. Anything to get me off her back. I've wasted so much of her precious time and she's found her saving grace. She throws at me the option to send in my phone. My only phone. My sole connection to the people I love. My one relay of emergency to the outside world. I can't do it, and I let her know. Then, all within seconds, Jennifer lets out one last barrage of canned responses. She flings and darts out of chat leaving me in tears. I'm appalled. That's it. No help. Nowhere. Jennifer kicks me to the curb and I'm sobbing in frustration. I just need help. I need my phone to work. I was doing my part and trying to work together. I needed a solution and Jennifer couldn't be bothered. Between wiping my eyes I click "No" in rage. Of course not! The only thing to come out of this chat was sheer agitation. Jennifer threw me in a pot, stirred frantically, and then left me without aid. Another rep pops up on chat. Once they introduce themselves I ask if they could please, just please read my previous responses and catch up. I can't fight anymore. I just need help. The rep leafs through the history. She checks where we left off. I confirm. Then, a single moment of clarity that made me want to launch my desk across the room. I wailed behind the screen. I'm done. I'm tapping out. I can't believe this has gone on for so long. My issue still isn't resolved. I tried to get help via Twitter with no avail. I'm fairly outraged to say the least. I've never received such flippant support from a company. 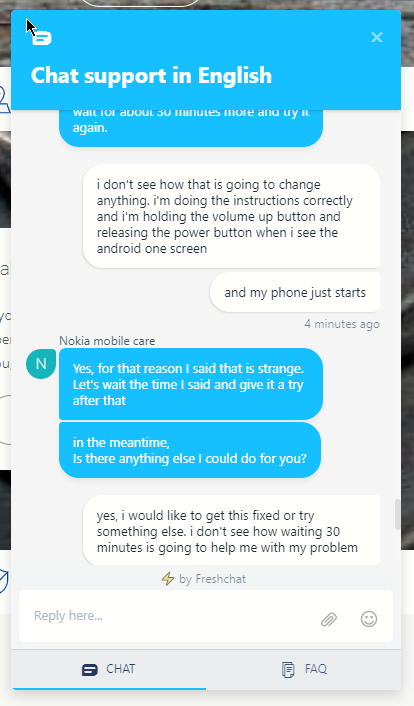 I'm not asking for help fixing a free fidget spinner I got at a Nokia event. This is a consumer device that I paid for and struggled with. UPDATE: Amazon helped me in 5 minutes. FIVE MINUTES. 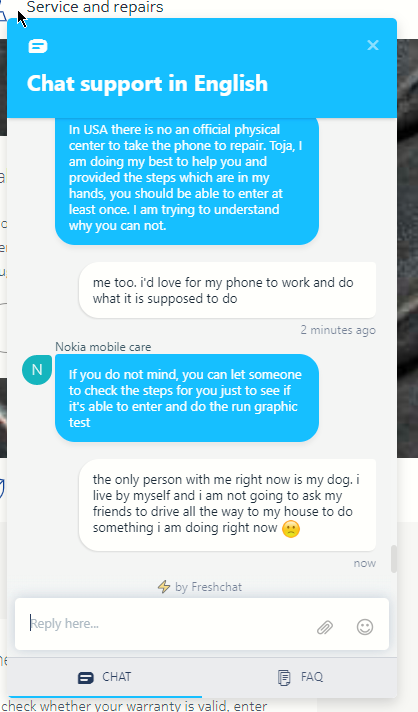 @toja I feel sorry for you are going through in hurry not read your entire can you just explain me in short what's the problem with your device. @toja I read all the story, and you are right. You wrote in your update that Amazon has helped you in five minute. Did they helped you in this particular problem and your problem is solved now? Or is it just an analogy? Gist for readers and for those who are lazy to read: Don't buy any device if you don't have physical service center near you. @naufrago thanks for the gist and analytical conclusion nice one. Press and hold Vol-Up and Power buttons simutaneously to power off your phone. When screen turns black let both go. Press and hold on Vol-Up button while you connect your phone to a PC using USB cable. Green droid lying on ground will appear together with no command warning. To give a command, press and hold Power button, press Vol-Up button once. Release both buttons after the boot options appear. Thanks for writing that. I know it's not much consolation to you but it's the best write-up of the customer service experience that I've read so far. 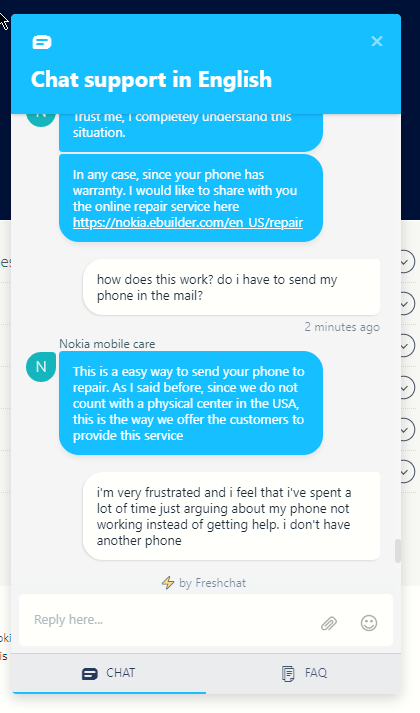 So many people experience the same as you - completely useless tech support operatives who click buttons on canned responses. It would be funny if it didn't have significant consequences on our lives. 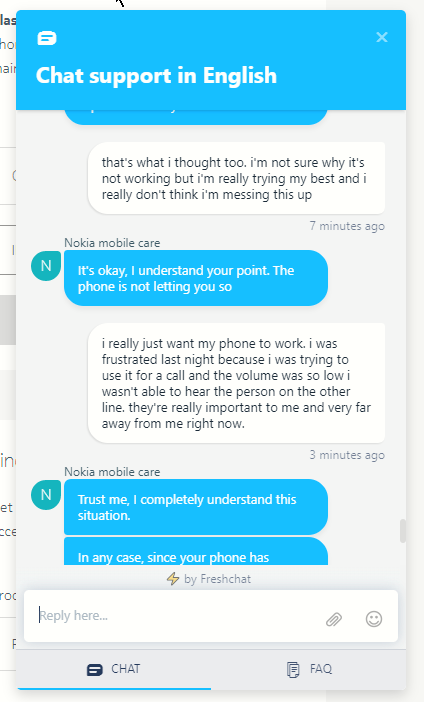 HMD really needs to work on the customer experience, because as well as the support a lot of other things at the moment are also dreadful.